Two good French bands at Pop In: Nitneroc + Milk and Fruit Juice. I love Pop In, but can we tell to Pop In to get better lights and not red and green, please? 9:20pm: around 50 people in the small room at Pop In. Their songs make you think of old video games themes. I enjoyed more their three last songs than the first ones. Good. Ah! I finally saw this band! I actually met some of the members a few times before, but I've never get the chance to see them all together in the same place. Fresh like... fruit juice! (#badwordplay) Joyful and sweet melodies, also melancholic ones. Songs played with ukulele, tambourine, acoustic guitar, electric guitar, glockenspiel, percussion, Nunchuk(yes). And soap bubbles. Listen to their last self-produced and self-released album called "I'm Cold Handed Cause I Have No Heart To Pump The Blood Through My Fingers" on their Bandcamp! You only can feel happy or have a big smile on your face when listening to them (really). Favorite tracks: 'The Glance Game', 'This Thing We Don't Have To Name', 'Did You Figure Out? ', 'The Perfect One', 'Things They Only Go'. Check out the various projects of the members and follow them on Twitter when they have one, you won't regret it. Does The Sun Still Shine Into Your Eyes? 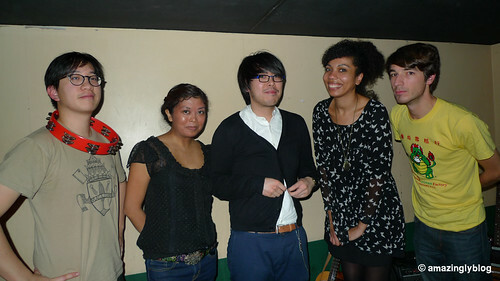 These five very nice persons will perform again next Monday with the very good Dutch band Bird On The Wire at Espace B. Give them support and go see them! C'est vrai que c'est étonnant que tu ne les aies pas vu jusqu'ici! Musical discoveries & unheralded songs from all over the world.